This site is an online showcase of our beloved dogs. Please come inside and visit. 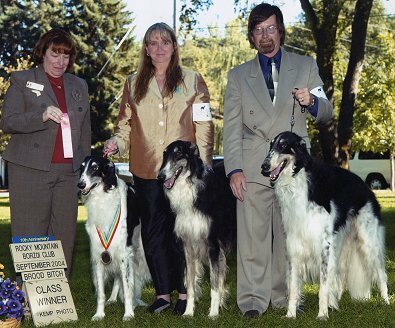 We occasionally have Borzoi or Silken Windhound puppies or young adults available to qualified homes. On the day before Thanksgiving 2015, we discovered that our websites had been obliterated by malware at our hosting service (Hostgator). Unfortunately I had never received notice that the webhost was no longer performing automatic backups for my site, much less providing security services. I am working on rebuilding this site (among others), so please excuse the "mess." Most of the content is up - but I am having to perform reinstalls of albums in the photo gallery which supplies the pictures for this site, so please bear with me as these are restored. Our Borzoi and Silken Windhound dogs are part of our family and our lives and schedules revolve around them. We maintain an ongoing relationship with our puppy buyers - they become our extended family! We are proud to be breeders of dogs that bring so much joy and love to their new families, and we love to hear stories of how they are doing with their new families. 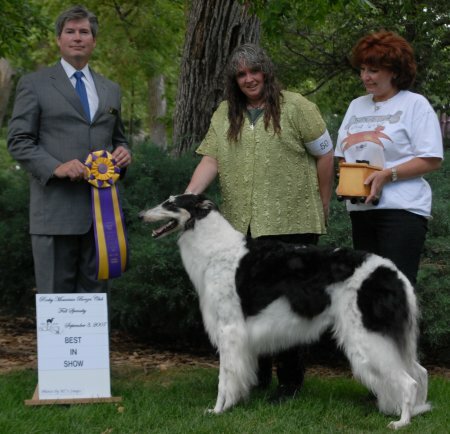 Tyler during one of his three International Silken Windhound Society national specialty show victories. No other breed can compare to Borzoi and Silken Windhounds - we feel they are the most awesome of dogs within the sighthound family. The Borzoi, once known as the Russian Wolfhound, is a breed of hunting dog within the sighthound group which includes such breeds as Afghan Hounds, Greyhounds and Saluki, among others. Their name is derived from the archaic Russian word for "fast." Popular with the Russian Tsars, these swift hunters were used on all manner of game including hare, fox, and on occasion, wolves. In these modern times, the Borzoi has become an elegant companion, although it can still be found on the hunting field in addition to various dog sporting events such as racing and lure coursing. 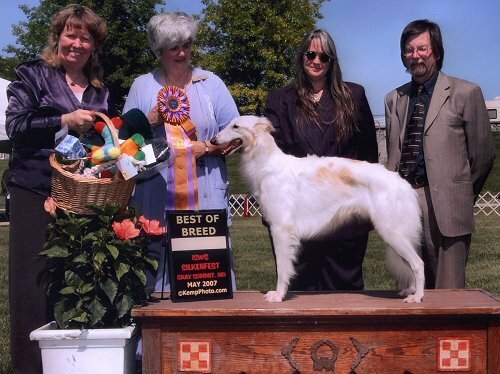 The Silken Windhound is a relatively recently developed breed, brought to life through the efforts of an Austin, TX Borzoi breeder by blending Borzoi and Whippet with a line of lurchers thought to be Whippet and, most likely, Sheltie. Silkens somewhat resemble a miniature Borzoi and people who are admirers of Borzoi except for their size, find them to be irresistible. 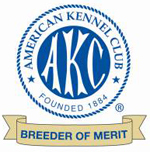 Silkens were recognized by the UKC in 2011 and since then have gained recognition in ASFA, LGRA and NOTRA, and can also be found performing in Agility, Obedience, Nosework, Flyball and Barn Hunt. Borzoi and Silken Windhound - Comparison of size. 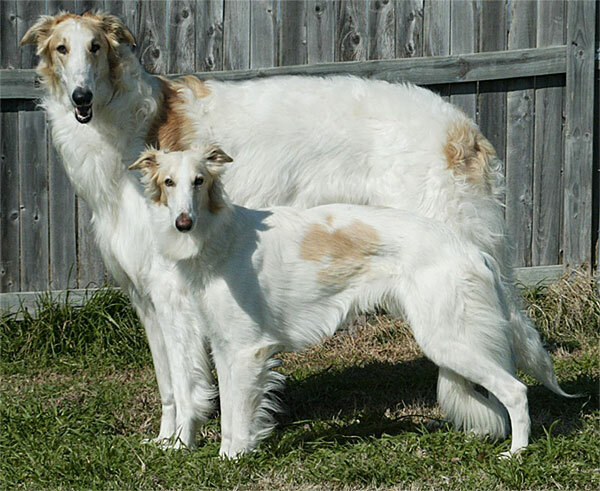 Our Borzois and Silken Windhounds on Pinterest.